OptiCal Sciences Particle Monitoring Systems are supplied fully validated using the GAMP5 project lifecycle approach. Documents will be written and tests will be executed at OptiCal Sciences Northampton and the customer's site to demonstrate that the system has been fully installed and operates within pre-defined limits. Details of the documents written and executed can be found on the following tabs. 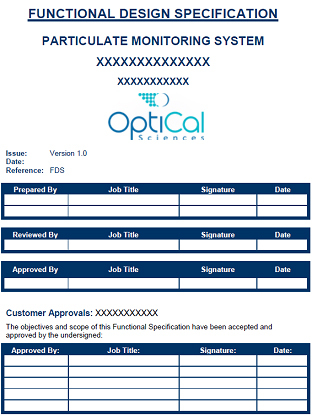 The validation documents will be written in MS Word in OptiCal Sciences format. The quotation does not include writing documents in customer required formats. The documents will be distilled into Adobe Acrobat format for portability and to reduce the file size to be manageable. The Functional Design Specification (FDS) details requested functional requirements of the system including hardware and software requirements. This document allows our customers to confirm that the proposed solution fully meets their requirements, and is used as the basis for the creation of validation and qualification documents detailed on the following tabs. OptiCal Sciences issues this document during the initial phase of the Particle Monitoring System design, and it is to be approved by the customer before work progresses on the system. The Factory Acceptance Test (FAT) document is produced by OptiCal Sciences after the development and testing of the Particle Monitoring System. This document details the pass or fail testing of functionality to be carried out on the Particle Monitoring System in a simulated environment that is representative of the customer’s process environment. Factory acceptance tests are carried out at either the OptiCal Sciences Northampton or Carlow office and are witnessed by the customer. Site Acceptance Testing (SAT) encompasses both the Installation Qualification (IQ) and Operational Qualification (OQ). 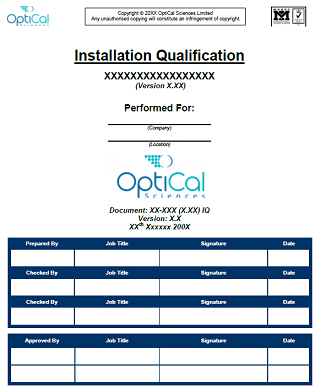 The Installation Qualification (IQ) document produced by OptiCal Sciences details verification process to be completed after the equipment and ancillary systems have been installed in accordance with the drawings and specifications of the system. The installation qualification is carried out at the customer’s site after the installation has been completed, and the requirements of the Installation Qualification (IQ) are satisfied before the Operational Qualification (OQ) is commenced. 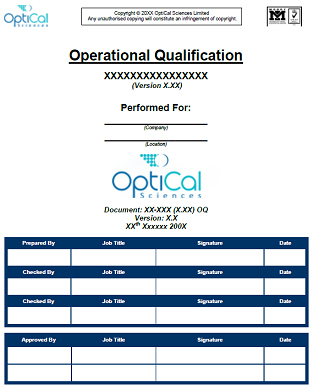 The Operational Qualification (OQ) document produced by OptiCal Sciences detail the tests to be carried out in order to demonstrate the compliance of the system with the requirements identified in the functional design specification. This test is carried out at the customer’s site after the successful completion of the Installation Qualification (IQ).